Blah, blah, blah: One More Major Blow to Illinois - Caterpillar considers leaving ILLINOIS! One More Major Blow to Illinois - Caterpillar considers leaving ILLINOIS! As a Cat stockholder this one saddens me. As an American this one sickens me. Another case of tax and spend politicians messing it up for everyone. "I want to stay here. But as the leader of this business, I have to do what's right for Caterpillar...The direction that this state is headed in is not favorable to business." Illinois & Quinn Make it official! More Taxes for everyone! My wife and I lived across the "Cat" plant in Montgomery, Illinois when we first got married. They're a staple in Illinois. This would cost Illnois roughly 4,000 jobs. As ABC news says, this comes after Governor Quinn signs into law a roughly 67% state income tax hike on both companies and individuals! This letter was not meant for the public, but the CEO, says that he's being wined and dined by many states. In truth, I can't get in the car without hearing some recruting pitch for companies in Illinois by other states. I know a number of people who have taken themselves and their businesses and moved out of state. It's all because Quinn isn't smart enough to attract new businesses and he can't stand up to the unions. I have to be honest.....for the first time in my life (I've been here my entire life), I'm looking at options for selling my home and moving out of state myself. I"m not going to shoulder the burden for all of Quinn's programs. So Stupid and so costly! 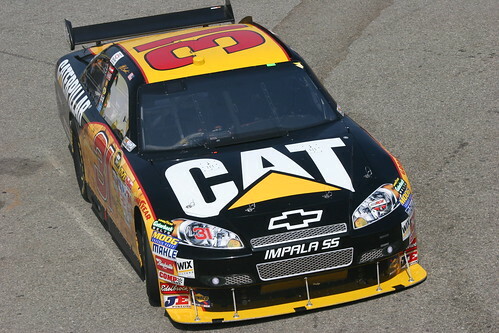 As a fan of the #31 Cat Chevrolet driven by VA's OWN Jeff Burton * I think this is a harbinger of things to come. Whether it is taxing internet sales or taxing businesses which can move in a hearthbeat *or lap around the racetrack * this is so short sighted for state and local governments. I agree Wallace. Hopefully more politicans pick up on this and do it the "right" way. Born and raised in Illinois, I left years ago during my working career and discovered that brighter horizons exist outside Ill. Trust me, there are many places you can choose to lower your tax burden. For me, I landed in Tupelo, MS. (NE MS) Not a bad choice. Besides, we have a CAT plant in Boonville, just 30 miles to the north. Randy- I have been considering buying a second home in MS. Thanks for commenting.